Michael Miu Kiu-wai (born 18 June 1958) is a Hong Kong actor. He was considered as one of the most popular young actors of the 1980s, and along with Tony Leung, Andy Lau, Felix Wong, and Kent Tong, he was a member of TVB's Five Tigers. 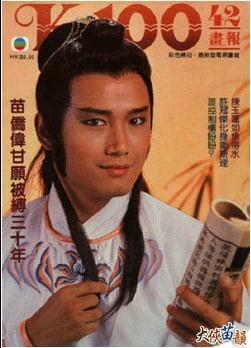 Miu's trade mark role was as the dashing and suave wuxia Knight-errant, although he is perhaps best known for the villainous Yeung Hong in the 1983 TV drama The Legend of the Condor Heroes. ICAC Investigators 2007	Principal Investigator Chan Kwok-wai (DJ)	Episode 4: "Over the Line"
Oh, he looks good as Eastern Heretic, Huang YaoShi. He has gone from playing the character Yang Kang to playing Huang YaoShi. Huang YaoShi did not like Yang Kang. It was a testosterone-filled birthday for the suave Michael Miu (苗僑偉), who turned 59 years on June 18, coinciding with Father’s Day. On Saturday night, while shooting a scene for Shaw Brothers’ web drama Flying Tiger <飛虎極戰>, Michael’s costars including Bosco Wong (黃宗澤), Ron Ng (吳卓羲), Eddie Cheung (張兆輝), Oscar Leung (梁烈唯), and more surprised him with a birthday party. The crew came out with a birthday song once the clock had struck 12 at midnight. Shaw Brothers executive Virginia Lok (樂易玲), who also produces the show, presented Michael with a birthday cake that read “handsome to the edge of the earth”. Michael’s wife Jaime Chik (戚美珍) surprised her husband with a bouquet of flowers, while his good pals Bosco and Ron gave him a much-anticipated birthday kiss. Michael Miu (苗僑偉) is now officially Hong Kong’s hunkiest 60-year-old actor! Celebrating his birthday today, it is hard to believe that the tall and handsome actor is actually 60. Michael stays fit by playing golf and soccer, and filming with younger stars helps him remain mentally sharp and trendy. A popular television idol in the 1980s, Michael took a hiatus from acting to found his eyewear business with wife Jamie Chik (戚美珍) in the 1990s, which they have since sold to made a lucrative profit. Returning to acting out of his own interest, Michael proves that he still has what it takes to attract viewers with popular hits, Line Walker: The Prelude <使徒行者2> and Flying Tiger <飛虎之潛行極戰>. Since June 12, Michael has been celebrating turning 60 with good friends Eric Tsang (曾志偉), Lawrence Ng (吳啟華), and others through dinner gatherings and golf trips. Looking at the photos, it is easy to see that Michael has formed many friendships throughout the various stages of his life, and connects well with young and old alike. Michael also knows how to enjoy life to the fullest and often travels with Jamie. Today, June 18, was Michael’s official birthday party. Surrounded by many friends, Michael had a great time celebrating his big milestone. With his son and daughter looking on, Jamie kissed Michael on the lips when the cake was brought out. With a loving family, lifelong friends, good health, and still a strong career, Michael Miu cannot ask for more.